Lately, I am addicted to pumps. I don't know but I really can't get enough of shoes. I also have undying love to anything skimpy like shorts and bodycon dresses. I think I'm suffering from quarter-life crisis that made me wish to bring back my teenage years. Okay. I admit I really hate getting a year older every year. I know I am not alone in this. When I was in high school, I want to get old and be in my 20's the soonest because I want to be independent, get a job, and have a boyfriend to spend the night over in my apartment. Lol! But now I want everything to get back to its old place. I imagine myself wearing these kinds of dresses, shoulder bags and pumps back in college; I could have steal boyfriends in a snap. Haha! I kid. Anyway, to end the week, I'm going to share to you my updated wishlist from here. Happy Friday everyone and enjoy your weekend! Oh wow, wow and WOW. These are such great pieces Jenniya. I wanna buy them all but my purse won't let me. 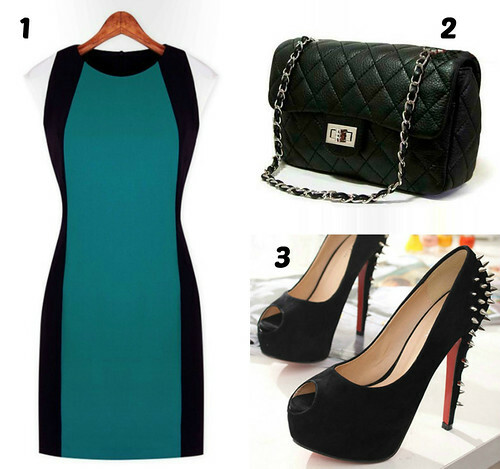 Love all of these, especially that black shoulder bag!! Chiffon floral dress looks amazing! Looks great, I like the second one! I adore that second dress it's so pretty. In love with the last one! Gorgeous ensembles, love the second look! we absolutely love the chiffon dress and embellished shorts! now we've got an itch to shop!thanks jenniya! I love the flower chiffon dress..really sweet dress..